Finish: ID finish of ball and ports are to a 20 Ra ID. Sanitary Solutions introduces the following: T Port Three Way Sanitary Ball Valve to service the Beverage, Cosmetic, Dairy, Food, Meat, Poultry and Pharmaceutical Industries. 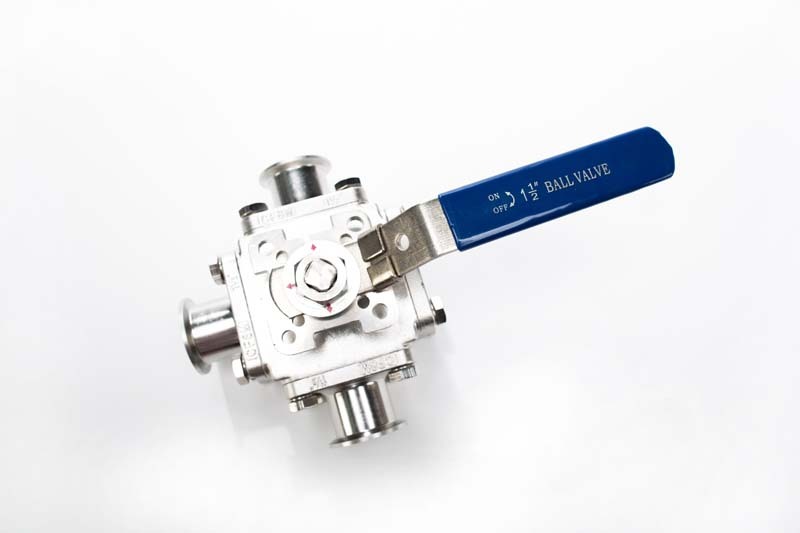 As you examine this valve with the pictures provided, look at the following features: Our "T" Port Three Way Sanitary Encapsulated Teflon® Seat ball valve has (3) RED arrows to show you the position of the valve and is designed to open as a full port design to reduce turbulence and pressure drop through the valve. 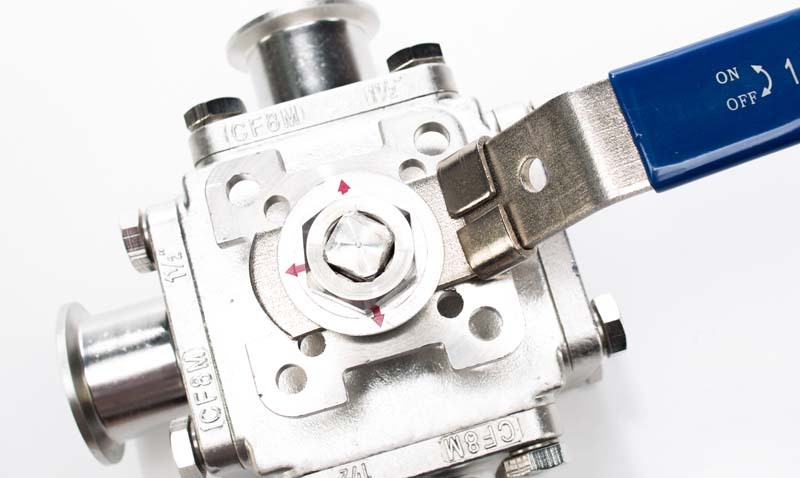 Upon opening the valve, you will notice a lock out handle to prevent tampering, ISO 5211 mounting pads for actuation, blow out proof stem, live loaded stem packing and a beautiful finish on the Inside and Outside of the valve. 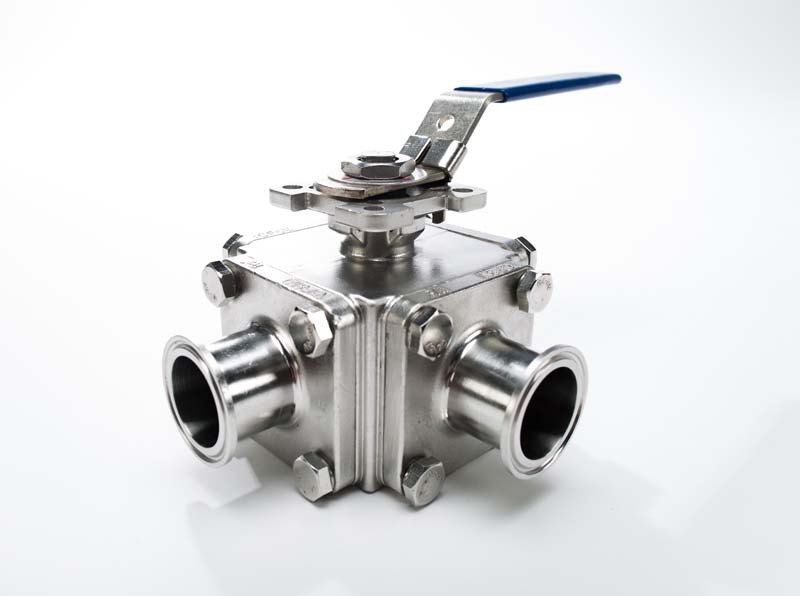 Since this valve comes standard with a clamp end, it is easy to assemble and disassemble when cleaning or working in a tight space. As for the wetted parts of our T316L "T" Port Three Way Sanitary Ball Valve, the ID finish of ball and ports are to a 20 Ra ID. 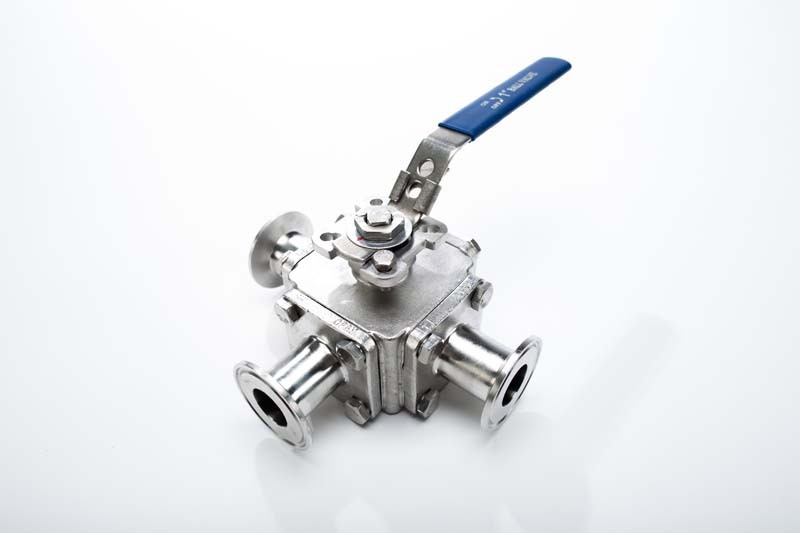 Sanitary Solutions T316L "T" Port Three Way Sanitary Ball Valve come standard with a fully encapsulated or cavity filled seat-- this is not an option since the fully encapsulated Teflon® seat reduces the threat of contamination for critical processes or products. 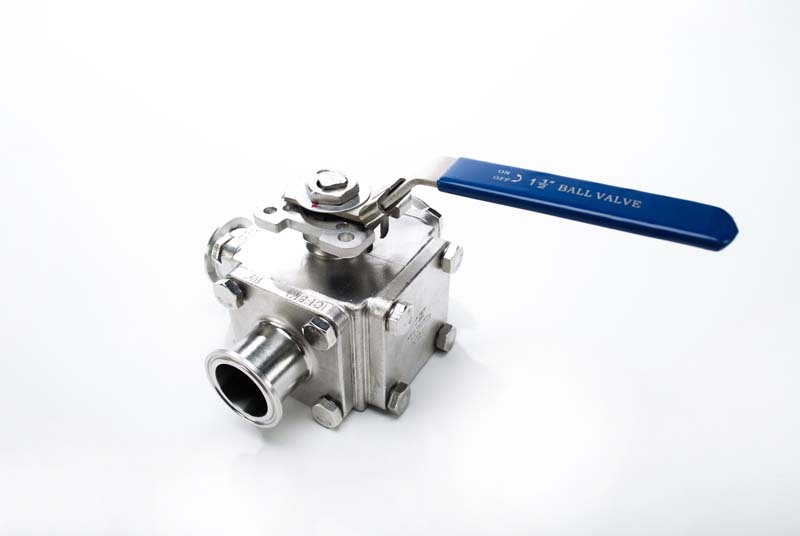 Our "T" Port Three Way Sanitary Ball Valve requires no special tools in the field to work on the valve, which is a plus when it comes to easy maintenance and low installation costs. We have each valve capped and bagged so you have no dings on the ends as well as permanently etching the size, alloy and heat number for full trace ability. Upon downloading the PDF Valve Sheets on pages 16 -- 18 in our "NEW SANITARY SOLUTIONS VALVES/PRODUCT RECOVERY SYSTEM CATALOG", take a moment and review the break torque, assembly torque and weight of each valve. Please keep in mind that the 1/2" -- 2" "T" Port Three Way Sanitary Ball Valve is rated at 1,000 PSI WOG and the 2.50", 3.00", and 4.00" sizes are rated at 800 PSI WOG. Sanitary Solutions stocks T Port Three Way Sanitary Valve repair kits and replacement handles for any size and will provide you with same day shipment and written confirmation--Call our sales team at 1-888-909-3569 or 1-855-640-7871 to assist you with stock availability, valve questions and repair kits.